KINGMAX Semiconductor Inc., a world-renowned professional memory manufacturer, announced the latest gaming series of memory and solid-state drive (SSD) products for COMPUTEX 2018, fulfilling the need of gamers and users for performance enhancement. With their adoption of the up-to-date 3D NAND stacking technology, the new series delivers larger capacities, higher stability and better performance than those with the traditional planar 2D NAND chips. 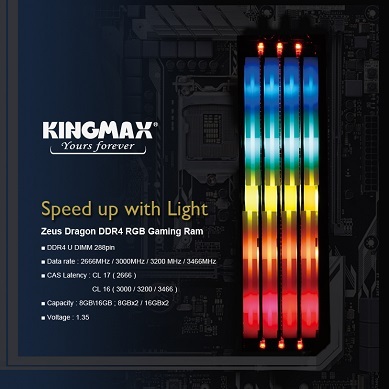 The newly launched Zeus Dragon DDR4 Gaming Series products include DDR4 RGB gaming RAM(2666-3466MHz) along with the exceptionally fast PX-3480 M.2 2280 PCIe NVMe Gen3X4 SSD, offering the best solution for storage upgrade to the burgeoning competitive gaming trend in the market, and the associated demand for upgraded computer performance. An observation of the trends in the memory market shows that the global gaming industry is obviously booming. In addition, the demands of the custom-built and modified computer market, and the need of workers for improved computer performance all still exist. Therefore, KINGMAX, as a professional memory manufacturer, naturally rolled out gaming memory and SSD products that can satisfy the gaming trends and the requirements for high-speed upgrades, thus giving consumers a greater variety of choice, regardless of their required performance or budget constraints. Now, everyone can enjoy gaming with blazing speed. The recently rolled-out series, Zeus Dragon DDR4 RGB Gaming and Overclocking RAM, comes in large capacities of 8GB and 16GB, and is available in the speeds of 2666, 3000, 3200, and 3466MHz. Moreover, the RGB LEDs offer a variety of lighting effects, and compatible motherboards with synchronization software can even create customized lighting effects and displaying unique, personal styles. In addition, all KINGMAX memory series provide three guarantees: high reliability, high durability, and high compatibility. Other than the market demands for gaming memory, for general business or work, people often also want to improve their operation efficiency of their computers, such as upgrading their computer equipment to higher-speed memory with larger capacities, or replacing their hard disk drives with solid-state drives. Both of these options can highly enhance the speed of computer operations and transmissions. The new PX3480 M.2 2280 PCIe NVMe Gen3X4 SSD unveiled this month is the perfect solution for workers or gamers who seek blazing speed. The KINGMAX PX3480 M.2 PCIe SSD adopts original high-quality IC ships with 3D NAND stacking technology and delivers stability, durability, and high compatibility. The SLC caching and DRAM cache buffer technologies enable faster data transmission and processing speeds. Moreover, the advanced LDPC ECC error-correction technology ensures the accuracy and reliability of data. In addition, the wear leveling technologies of the RAID engine and data shaping also assist in the data integration and accuracy as well as extend the SSD's service life.